TAKE ACTION: Contact Governor Rendell TODAY! On March 15, U.S. Transportation Secretary Ray LaHood announced the Departments' new Bicycle Policy Statement that heralds the end of second-class treatment for cyclists. The statement reaffirms the language that is written in the current federal surface transportation law and demonstrates his leadership in this area. This is an important step in completing bicycle and pedestrian networks all over the country. Please contact your Governor today to urge them to ensure that your state department of transportation is following the letter of the law. Turn the Tide on Obesity! As a pediatrician, my number one goal is to keep children healthy. Yet, over the 30 years I’ve been in practice, there has been a distressing increase in the number of children and adolescents who are overweight and obese. Today, most physicians are dealing with overweight and obesity in about 30 percent of the children we treat. These staggering numbers have alarmed the pediatric community, and they should spur us as a nation into action. As the president of the American Academy of Pediatrics, I was honored to stand beside First Lady Michelle Obama when she launched her “Let’s Move!” campaign last month, which aims to overcome obesity in this generation of children. Health promotion is everybody’s business. The First Lady’s initiative is based on this notion, and her work is bringing together civic leaders, educators, business leaders and health care experts to support families and children. Right now, unfortunately, we have a serious problem on our hands. Many of our children are not strong and healthy. Overweight toddlers struggle to toddle. Obese children succumb easily to asthma and other respiratory diseases. School-aged youngsters who are overweight and obese have a very high risk of bone and joint problems. Obese teenagers suffer from health problems such as diabetes, hypertension and clinical depression. So what can parents do? Start at the beginning. Healthy nutrition starts as early as infancy with breast feeding. Once your baby begins eating solid foods, introduce nutritious foods early on and often. It is also important to encourage play time as soon as they start crawling and walking. As your children grow, continue to help them live a healthy active lifestyle. Create a healthy home environment where physical activity is encouraged, nutritious low fat food options are available, and screen time and sugared drinks are limited. The Academy is doing our part by calling on every pediatrician to calculate body mass index (BMI) for every child over the age of two at every well-child visit. We are encouraging our 60,000 pediatricians to give out official child-friendly “prescriptions” for healthy, active living—good nutrition and physical activity—at every well-child visit. Using these “prescriptions,” pediatricians will work with families to set goals for good eating habits and physical activity. It will take all of us working together to help create healthier communities for our children—communities where children can run and play and feel safe; communities where families have access to fresh foods and where neighborhoods celebrate nutritious eating and find joy in watching children grow up strong and healthy. The health of our children—and the future of this country—is in our hands. Together, we can make a difference. Together, we can turn the tide on childhood obesity. Ride Your Bike With Coolness and Confidence! WalkBikeBerks Presents Bike Riding Course! If you answered yes to anyone of these questions then we have a class for you! WalkBikeBerks is hosting it's 2nd Annual League of American Bicyclists "Traffic Skills 101" course on Saturday April 17th at the Upland Center of Alvernia University. The class will be taught by WalkBikeBerks board member and Certified League instructor Benton Levengood. It's time to put away the excuses of NOT riding your bike. Take this course and be cool and confident on your next bicycle ride and enjoy the experience the way it was meant to be! WalkBikeBerks is offering this course ahead of it's promotion of Bike To Work Month in May and all the activities will will be promoting. Send in your reservation today! We promise you will NOT be disappointed. Secretary of Transportation Ray LaHood issued a new policy statement on March 16th that calls for full inclusion of pedestrians and bicyclists in transportation projects, with particular attention paid to transit riders and people of all ages and levels of mobility. Blogging yesterday, Secretary LaHood said, "This is the end of favoring motorized transportation at the expense of non-motorized. Lovely Day for a Bike Ride! Lovely Day for a Bike Ride? Try New Cycling Directions on Google Maps. BREAKING NEWS: U.S. Representative Earl Blumenauer (Ore.) introduced H.R. 4722, the Active Community Transportation Act of 2010 in the U.S. House of Representatives on Tuesday, March 2, 2010. Encourage your U.S. representative to co-sponsor the legislation now! More than 700 delegates from across the nation will meet with US Representatives on March 11 to talk about H.R. 4722. If you could not make it to the National Bike Summit, but would like to participate in our movement, call your Representative RIGHT NOW! Thousands of people across the nation will be calling in too -- making your voice and your request for better walking and biking clear and strong in Congress. View more presentations from National Complete Streets Coalition. Have you ever walked down the sidewalk and nearly tripped over a raised piece of concrete? Do you choose to drive to work instead of bike because you feel safer? These are some of the issues being addressed by the Reading Area Transportation Study Bicycle and Pedestrian Transportation Plan Advisory Committee. 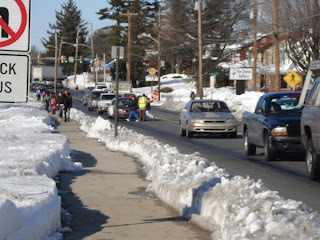 "Our goal is to increase mobility and get people out of their cars in a safe, efficient manner," said county planner Michael D. Golembiewski, who runs the committee. This is not a recreation plan, but a plan to make biking and walking viable modes of transportation, Golembiewski said. Posted: Sunday, February 28, 2010 11:45 pm Updated: 4:33 pm, Thu Feb 25, 2010.